If you are lucky enough to fly Emirates First Class, you may have seen a very familiar face on a recent flight. Famous beauty entrepreneur Huda Kattan decided to do a beauty tutorial on a trip from Dubai to New York. 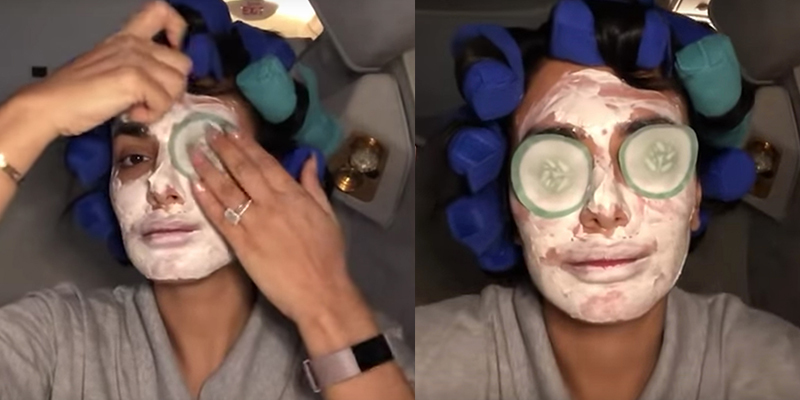 The beauty mogul tries out various flight-friendly products in the YouTube clip, including heat free rollers, Nourish My Eyes cucumber pads and a LIXIRSKIN soft clay rubber mask followed by a second treatment using the Tony Moly intense care snail hydrogel mask. At point, even Huda’s daughter Nour Giselle makes an appearance, popping her head into her mother’s booth on the 14 hour flight. Proving that transatlantic travel shouldn’t hinder anyone’s beauty routine, Huda follows her skincare tutorial with a full make up look on board the flight. See the full beauty and make up tutorial here!